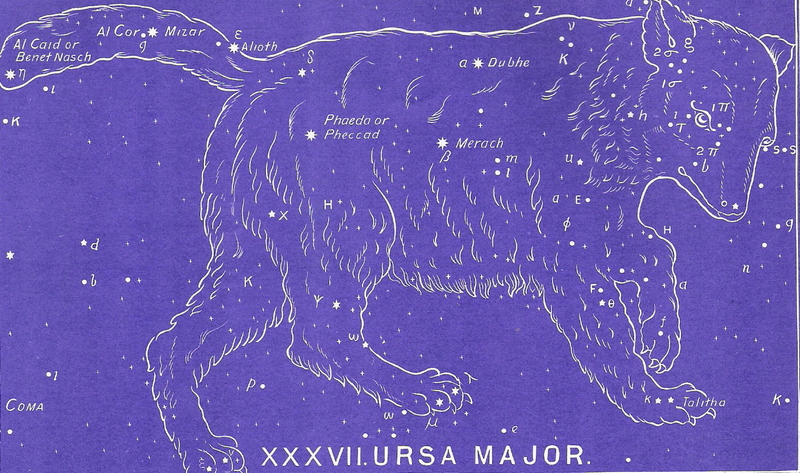 Like the constellation known as “Little Bear” (Ursa Minor), this sign also has many legends from many different lands all over the world. But also, like the other sign, very few come anywhere close to the true meaning of this beautiful picture. One, from Greek mythology, relates this constellation to Callisto, the daughter of Lyacaon, the king of Arcadia. The story involves Lyacaon being transformed into a bear. As we have seen earlier in both Cancer and Ursa Minor, the very idea that this sign was originally designed to be a bear is absurd. Bears don’t have such long tails. Furthermore, we have seen that this whole scene (Cancer and its decans) should be considered as one large pastoral setting with, most likely, a donkey lying down peacefully between two flocks of sheep. In Ursa Major, we see yet another area of conflict to be resolved — the vast population that will cover the earth, and all the many logistical problems that entails. Today, we know that man has the technological ability to solve many of his own problems. For example, there is no technological reason why there should be famine, or the droughts that so often cause it. Certainly we can grow enough food to feed the present population of the world very easily. And we could convert water from the oceans around us to provide adequate reserves for irrigation during times of drought weather. The problem is that we simply do not do the things that we know to do! Why? Because of a whole assortment of political, economic, religious, and other reasons, none of which are sufficient to justify our inaction to the reality the million face starvation every day. Because the millennial kingdom will be a virtual paradise from north pole to south pole, and because mankind will once again live to be of a very great age (a man of a hundred years will be mourned as if a child has died) then doesn’t it seem reasonable to conclude that the human population will literally explode? I believe it will, for the Bible says that the “knowledge of the glory of God will COVER THE EARTH.” That sounds like a heavily populated earth! But it doesn’t necessarily mean a crowded earth. The millennial kingdom will be a time of prosperity for everyone. Here is the “Greater Sheepfold” of which Jesus spoke in John 10. The “other sheep” mention in that passage which were not of “this fold” (Ursa Minor, the Little Bear) were the vast multitudes of Gentile believers who would respond to the gospel all down through the ages of church history. This was a great mystery hidden from all the Old Testament prophets and not revealed until Paul’s day. Yet, it was the eternal plan of God that He should present to His Son, a Bride composed of both Jew and Gentile. What a blessed assurance of His eternal grace! Pay careful attention to the meanings of the star names below. They will ALWAYS back up the message above. To continue in the correct order of the ancient star chart, please select Argo next. Be sure to download your copy of the Free e-book that discusses the historical, biblical, and cultural evidences for this amazing star revelation.